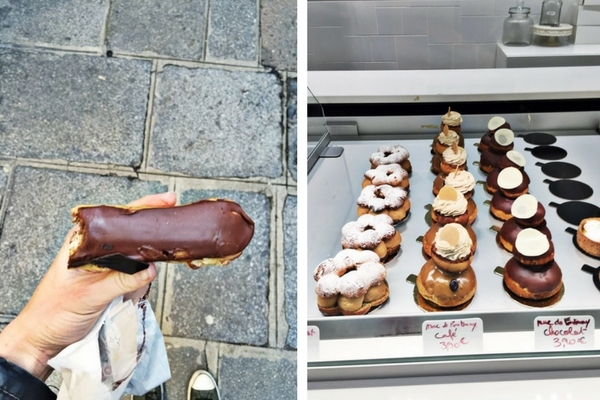 Paris has been a gluten-free beacon of love and carbs for us over the last two years. I’m usually not that into Hallmark holidays, but last year, for whatever reason, when Charlie told me he’d be traveling on Valentine’s Day, I got a little diva-like pit in my stomach. I pictured myself sitting alone watching Sandra Bullock reruns with a 3-course meal of matcha truffles, modestly-priced steak, and salted caramel pudding. Then I immediately moved on to a superior alternative that made me a lot less sad: having dinner with my OG Valentine, my dad. I don’t know why I cared so much about doing something special last year, when on most other Valentine’s Days my preference is to avoid prefix menus like the plague and do nothing at all. But I’m sure it had something to do with all the book-related work that left me craving an evening of being coddled and pampered. Other sugar daddy to the rescue! The biggest reason I can’t give Charlie a hard time is because for my birthday this year, he already showered me with the most romantic gift a girl could ask for: a long weekend trip to Paris. Had he pulled that super Romeo move on me on February 14th, I probably would have rolled my eyes and barfed a little in my mouth (diva!). But in November it was the perfect gift. 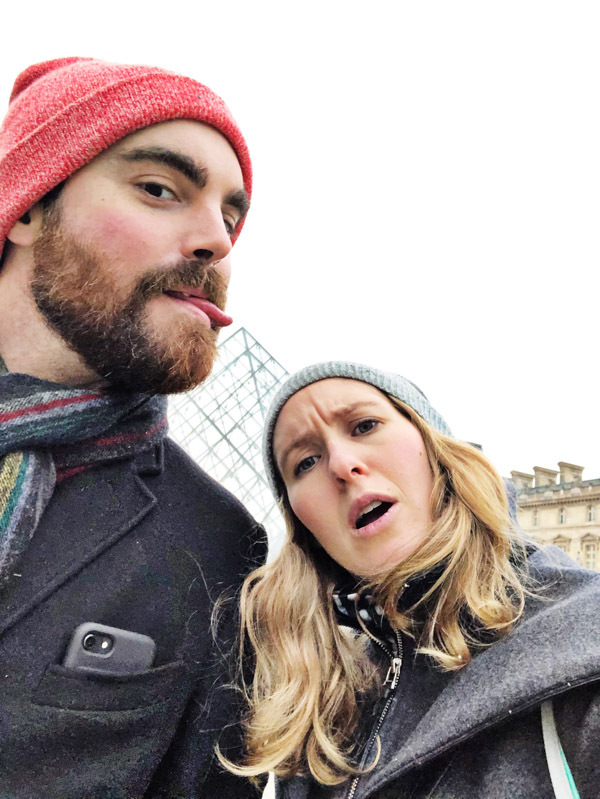 And come December, when we finally woke up on the tarmac of Charles de Gaulle airport, it was the beginning of the most make-out and food-filled trip I’ve taken in adult life. 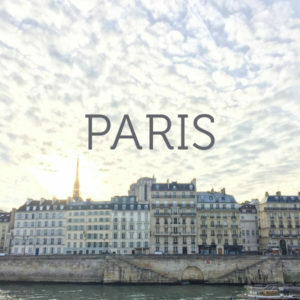 Paris is the city of love, yes. But for me it’s always held memories of a different type of romance. Back when I was three years old, my OG Valentine (along with my mom) moved our small nuclear family across the Atlantic for a few years. 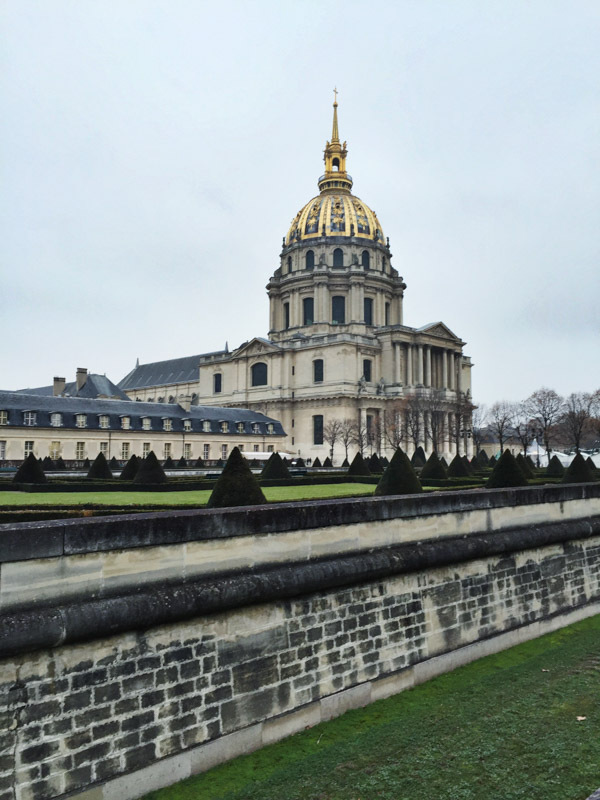 We lived a stone’s throw from Les Invalides on the Right Bank, which I used to call the Emerald City because of its gold dome and sprawling Oz-like greenery. So my favorite moments of our trip were not the pounds of steak frites or kisses shared under the Eiffel Tower, it was getting to share all those childhood fragments with Charlie as we covered the city on foot from end to end, having him humor me as we played the game my mother and I always used to play of guessing what color the seats would be at the following metro stop, and humoring me even further when I wanted to take us another mile out of the way to relive what a chocolate eclair tasted like in gluten-free form. Speaking of being gluten-free in Paris, it’s a lot easier than it used to be. I’ve included some of the recommendations below, but just know that like in the States, not every loaf of GF bread is created equal. Take a detour to Chambelland early in your trip and buy a loaf and carry it in your purse for the rest of your stay. 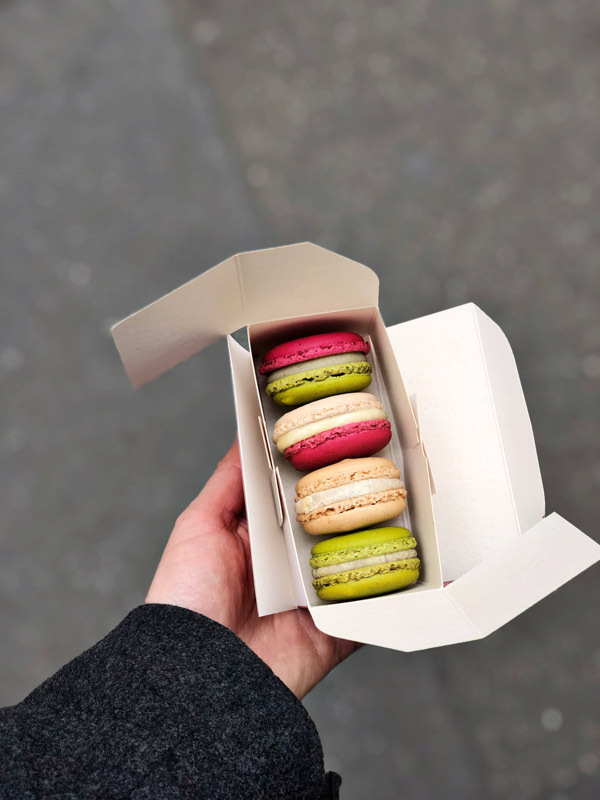 I tried the ones at Eric Kayser, No Glu and Helmet Newcake and they weren’t as good. This is key, because you’re going to need something to soak up all that restaurant butter. If that’s recommendation 1.a. for the GF folks. 1.b. for the rest of you is to balance your trip with a mix of old and new. 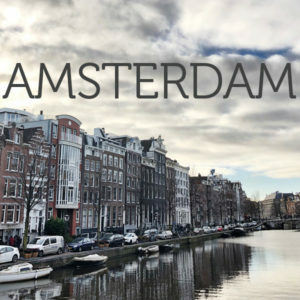 You’ll see in the itinerary I laid out below that I didn’t give you a back-to-back bistro highlight reel. 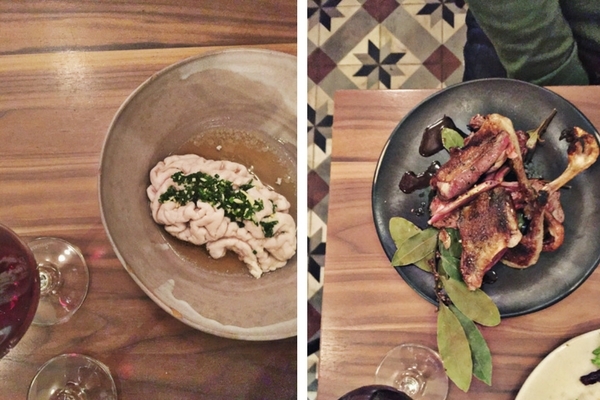 There’s some incredibly inventive cuisine happening in Paris right now that is worth taking a break from cassoulet and soupe l’oignon for. Plus, if you eat on the healthier end at home, you will burn out from this particular French brand of hedonism very quickly. Pace yourself, folks. My last recommendation is to walk as much as you can. It’s truly the best way to see the city. We managed to log 10 miles a day! Pack your shoes accordingly, and bring a second pair, since you will inevitably get blistered from your first. 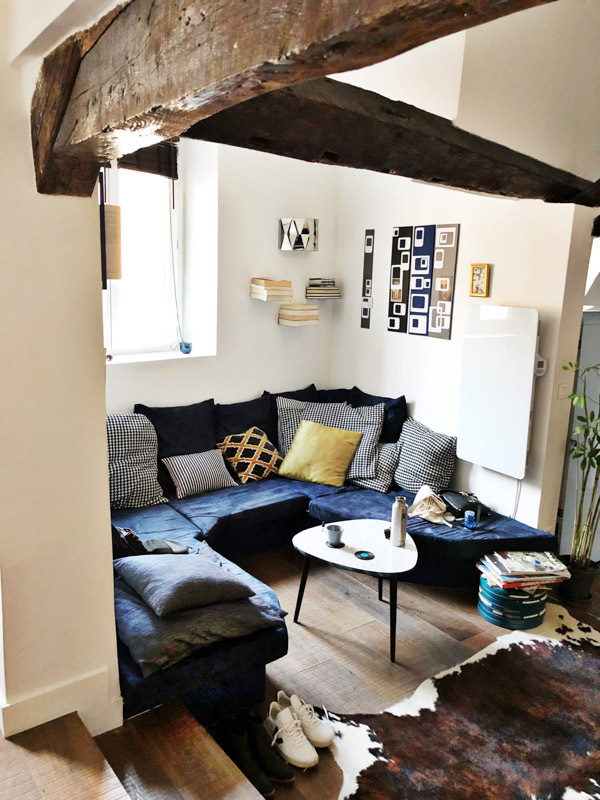 We loved the little AirBNB we stayed in on the 5th floor of a immeuble in the 9th, even if it meant many more blisters walking up all those stairs! 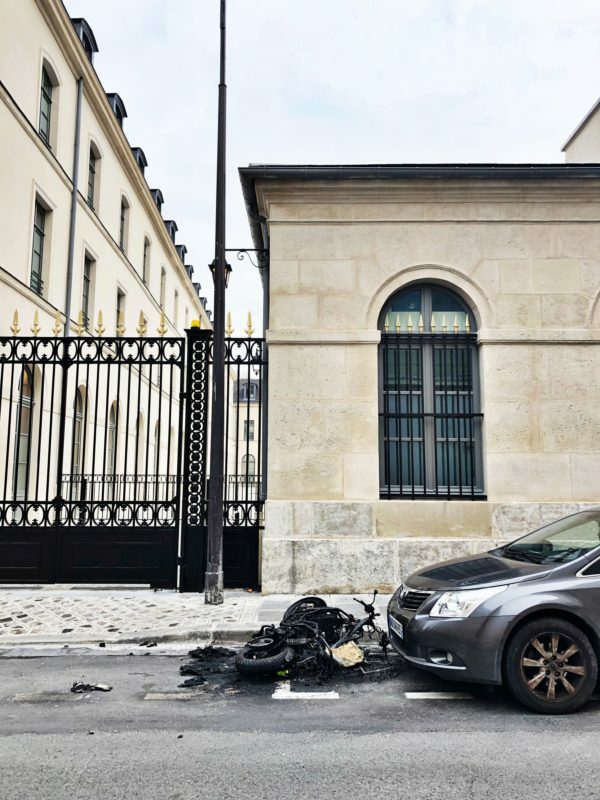 This time around, it was definitely a sobering experience for us bourgeois lovers of Parisian oat milk to experience the Gilet Jaunes lighting the city on fire literally and figuratively with their anger. 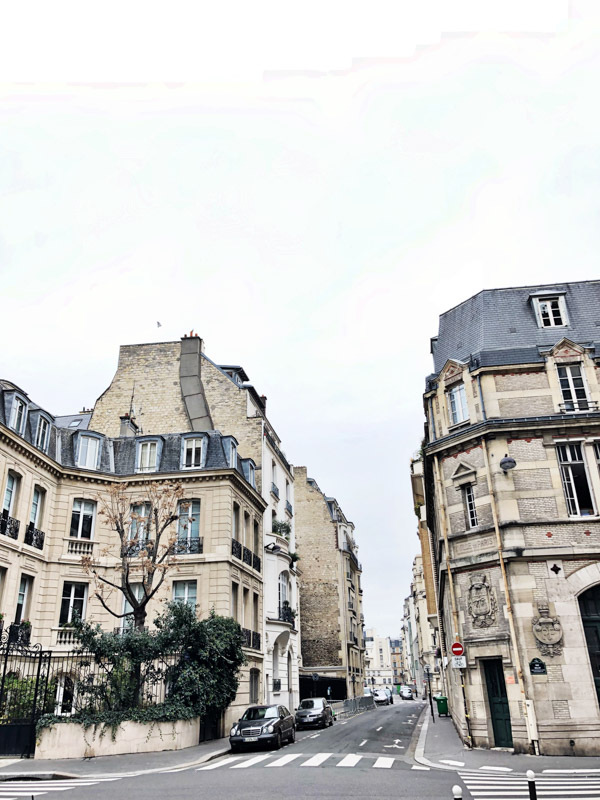 You can see some of the scenes below, juxtaposed of course with my favorite 3 euro macarons. Needless to say, I couldn’t feel more grateful for the life I was born into that allows me to see the world, and savor every morsel. Just being able to reminisce about this trip feels like a gift. And let me just say for all my Galentine’s: you don’t need a date to have the most glorious time in Paris. My last two trips 7 years ago and in college were both solo, and I had an equally magical weekend reading, wandering and day drinking in cafes. Read on for my favorite gluten-free finds and ways to spend a long weekend in the city of luuuuurve. This was our first food stop in Paris, after fighting our jetlag to make it through two floors of the Pompidou Center on an empty stomach. 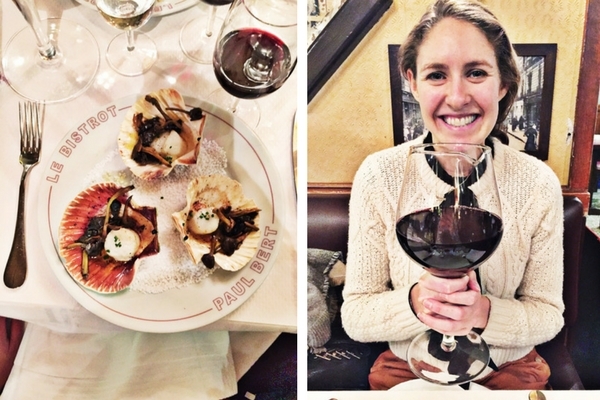 Needless to say, I was extremely hangry by the time we arrived at this little gem in the Marais, and almost had a meltdown when we were told there was no table available. Luckily, the maître d’ took pity on us silly Americans and found us two seats next door at the small to-go shop. We actually got the better experience, I think. 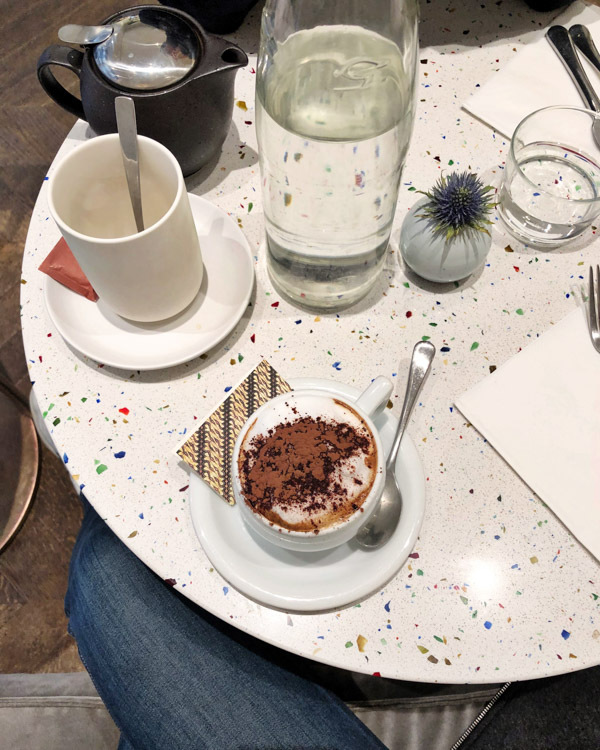 As we waited for our gluten-free buckwheat crepes to arrive, we sipped a carafe of their in-house hard cider and drooled over all the delicate tins of sardines, cases of smoked meats, rich butters and countless products made from the restaurant’s signature buckwheat. Just make sure to read the back of the packages, as many of the pastas and crisps also include wheat flour. As for my order, I went with the special, which included cured duck, mushrooms and comte. But you can’t go wrong with the complet. L’As du Falafel, The Marais. Back when I could eat gluten, this was a very necessary stop when visiting the old Jewish quarter of the Marais. The streets are worth visiting anyway, as the trendy boutiques suddenly tapper off into a jam-packed block of Judaica. The falafel is the best in the city, but they also have schwarma for the GF folk. Down the street from all the falafel shops in the Jewish corner, is this Israeli outpost with creative spins on classic sandwiches. The lamb pita is excellent, but they will also do any of their sandwiches as a plate for the GF folk. I got the beef bourgingnon, which is not something I would think to try at an Israeli restaurant, but their take on it was incredibly light and flavorful, especially with a dousing of green sauce on top. 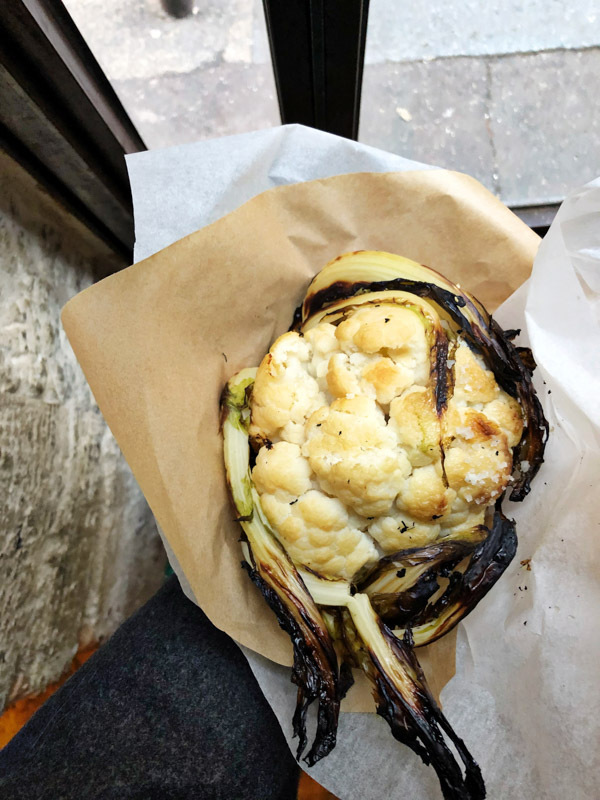 The highlight for healthy-minded folks is the whole charred cauliflower, which emerges still attached to its leaves and roots. New Yorkers: you can also find a stand in Chelsea Market, but it’s not the same as the original. This gluten-free bakery was the only place I found that did French bread the right way. It had the same crispy exterior and tangy sourdough flavor that characterizes the best of the table baskets. Get a loaf to-go, or simply enjoy a tuna sandwich or square of focaccia (tomato-olive is amazing) as a mid-afternoon snack. Also, get a bag of the mini financiers. In addition to being the best-named patisserie in all the land, Helmut Newcake has the type of highfalutin pastries that make you think you’re staring at a jewelry case—and they’re all gluten-free! It was such a treat to get to have a chocolate eclair after all these years. The chocolate chip cookie is also insanely buttery and decadent. Breakfast isn’t as much of a “thing” in France as it is in the states. Usually, people just grab a croissant and cafe on the go. One morning when we were craving eggs, we ended up at this cute spot near our hotel. Honestly, the breakfast was pretty underwhelming. But it’s worth a visit for the gluten-free green tea financiers, which were the most delicious treat of the trip. Had we done it over, I would have saved my breakfast for when we visited Canal St. Martin (see below). We didn’t manage to squeeze in some eggs or black rice porridge from Holybelly, but walked around the cool and quaint surrounding area of Canal St. Martin, where there are a bunch of up-and-coming juice bars (Bob’s) and gluten-free cafes (Ten Belles) popping up. This is definitely the neighborhood to go to if you want a break from butter. 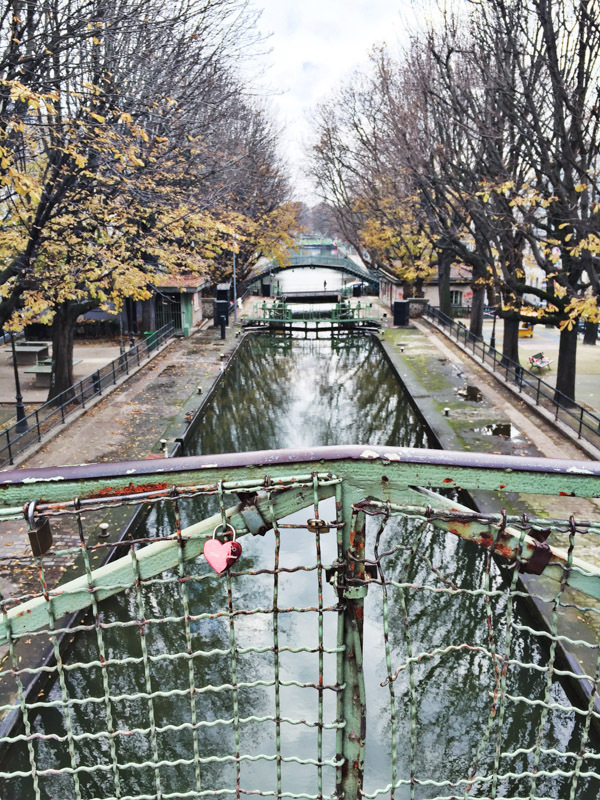 And I loved capturing the heart-shaped lock picture above. This hotel restaurant has a quaint fashionable interior with a beautiful garden to sit outside in warmer months. 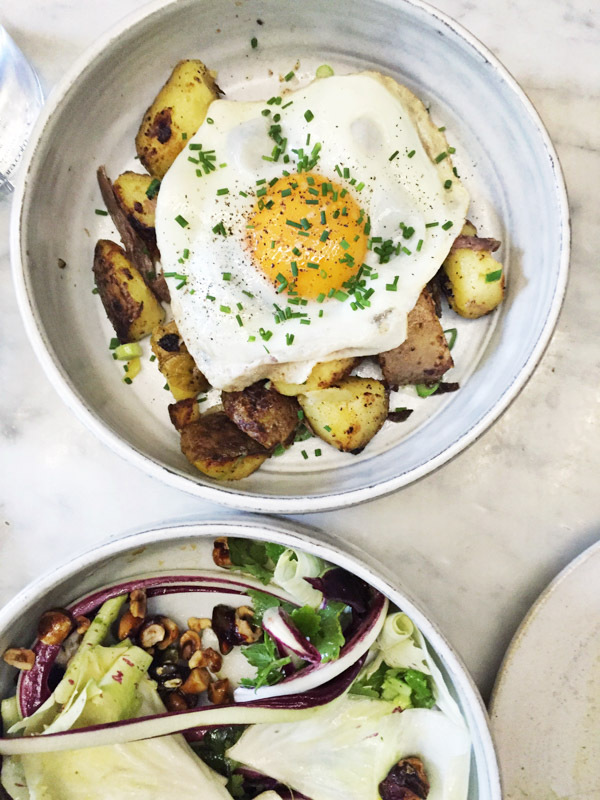 It’s an excellent spot for brunch, with a whole array of vegetarian options. The vegan butternut squash soup was delicious, as was the poulet roti and plate of scrambled eggs. This brunch spot has all the usual Southern fixtures—French toast, fried chicken, duck hash—but they’re prepared in a distinctly French way. The hash was a gluten-free favorite of mine, and I also loved the beet salad with homemade light-as-air Greek yogurt. 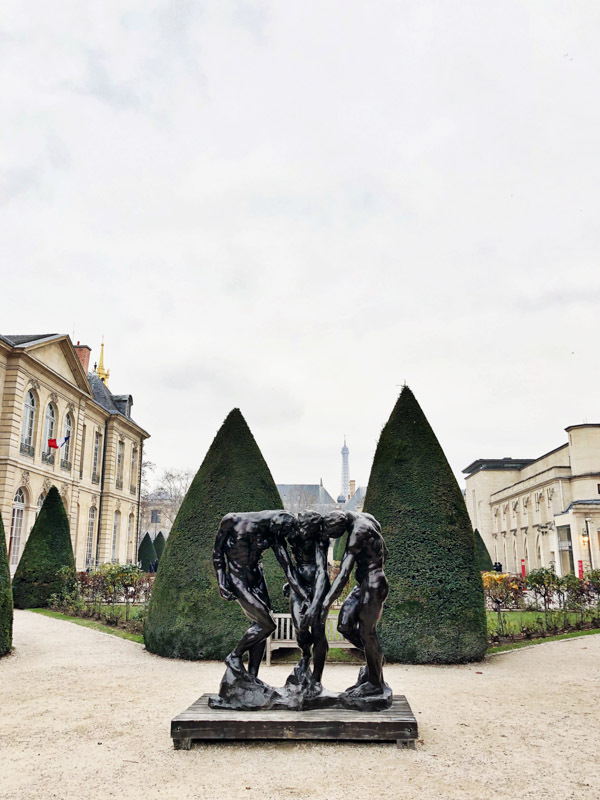 We wandered into this little neighborhood gem during our day of exploring the right bank, as we made our way from Musee D’Orsay to go make-out under the Eiffel tower. It was everything we wanted in a bistrot: small tables, chalkboard menus, old ladies ordering whole bottles of wine at 2pm, and husband and wife waiters, who took breaks in between busing our tables to enjoy a bite of lunch with their family at the back table. The most notable dish here is the veal stew, which is served over cardamom scented rice. Unfortunately, it’s thickened with flour (hey-ho France), but I snuck a small taste of the sauce and it was mind-blowing. Equally good (and gluten-free): the escargot, salad Paysenne with thick lardons, and the sautéed scallops. 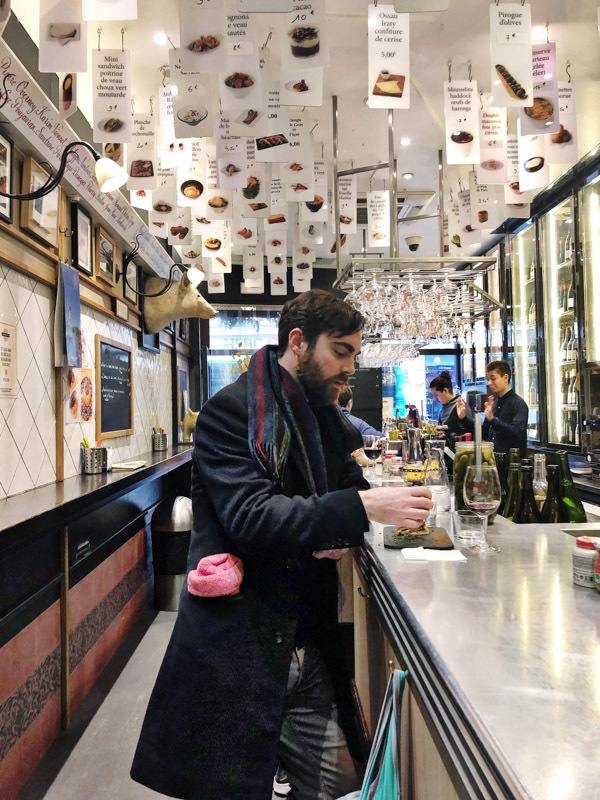 The two small bars next to one another, one dedicated to seafood, the other to meats, are a fun concept based on basque-style pintxos, where you order small plate after small plate, standing up, before heading to the next joint and doing the same. 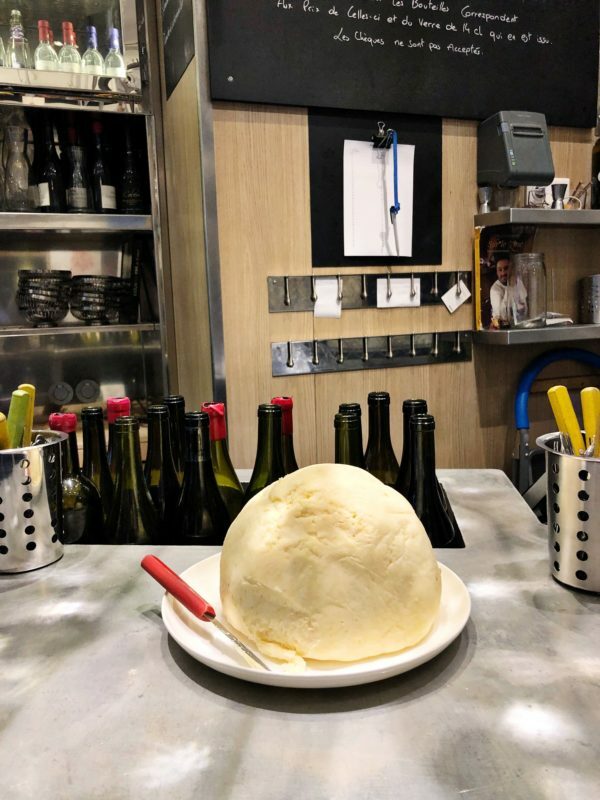 I love that they serve butter in a giant ball on the counter that you can scrape off to your heart’s content. 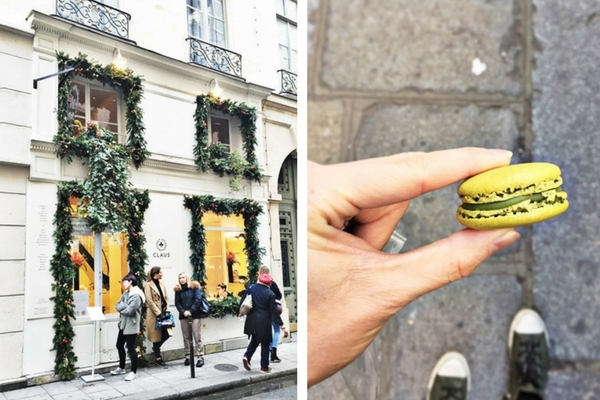 Perhaps the most famous macaron purveyor in Paris, Pierre lives up to all the hype. The cookies are light and tender, while the filling isn’t too sweet. More importantly, they offer a variety of surprising and creative combinations. My favorite was the half raspberry, half pistachio, and the pomegranate and cream. As I mentioned above, I was not overly blown away by the bread at this gluten-free cafe. Still, it’s a nice place to grab a sandwich, and if you’re craving a croque monsieur, theirs certainly hits the spot. I’ve also heard good things about their quiche and madeleine’s, but generally prefer chambelland and helmet newcake for GF goodies. The menu changes daily at this veg-centric small plates joint. The chef is young and inventive, but also can turn out French classics like moules with aioli that rival the best bistros in town. They were willing to adapt almost the whole menu to be gluten-free and also had plenty of vegan options. Besides the moules, my favorite dish was the broccoletti with caviar. Charlie could not resist the fois gras stuffed quail. 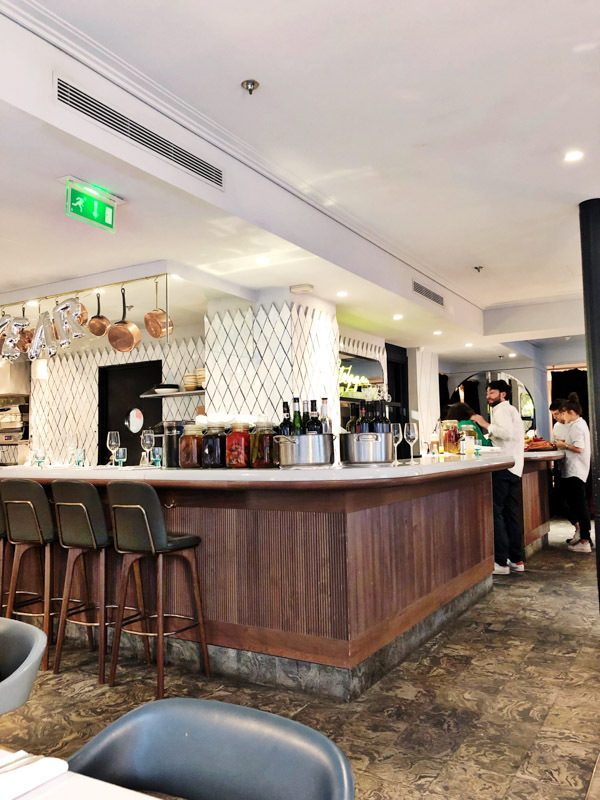 We went for lunch at this upscale Israeli restaurant near The Louvre, but it’s chic design and cool lounge in back would make it even better as a nighttime destination. The kale salad with turmeric aioli and Mediterranean take on steak frites (both GF!) were fabulous. The waitstaff was also very knowledgable about my allergy. Right down the street from Chambelland, is this classic bistrot that serves up impeccably cooked steak and other French fare. It’s been renovated to be slightly more modern on the interior, but still feels homey and cozy. It’s a great option for a casual, yet refined meal that’s unfussy and worth the price tag. 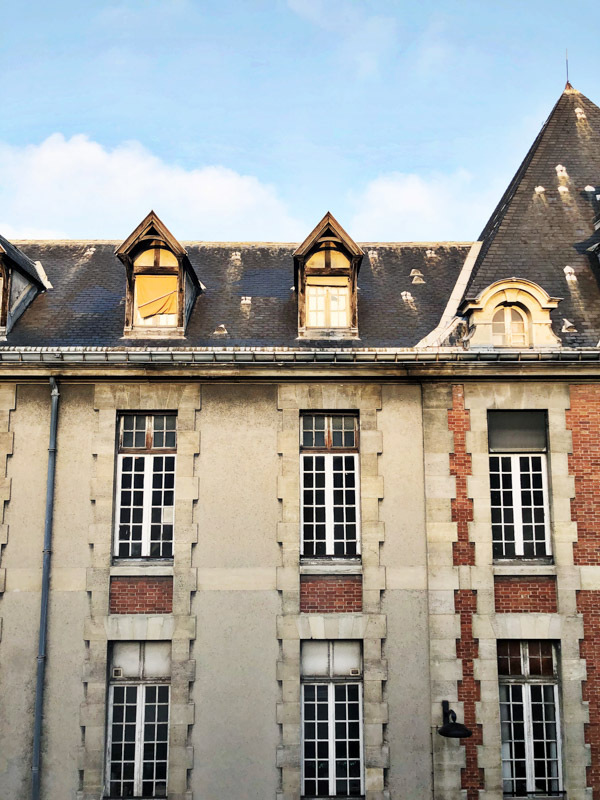 Though a bigger operation than Tonneau, it doesn’t get more classic than this French institution. 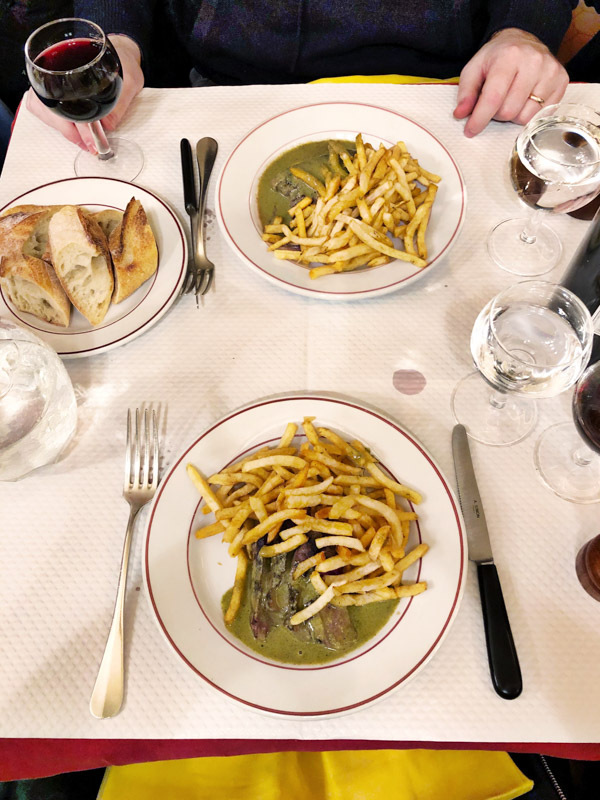 It’s a little off the beaten path, but worth a visit for a traditional meal of all the things you came to France for: sole meuniere, steak frites and soufflés. Gluten-free folk are good to go on the steak and fries and simple butter-soaked scallops in their shell, but sadly have to sit out dessert. My favorite part of our meal is that they decanted our wine into a giant wine glass, which made for some wonderful photo opps. I’m pretty sure they stuck us in the front room with all the other English speakers for this very reason. This was both Charlie and my favorite meal in Paris. I was skeptical at first, as I’m not one to opt for trends or novelty over the classics (in Paris, no less). But this meal was truly the most inventive and delicious one I’ve had in any city in recent memory. Much to my surprise, the highlight of the night—in addition to the whole pigeon that arrived talons-on, and still smoking on a plate—was the bowl of brains. As you can see above, they did very little to distract or disguise the main ingredient, which I suppose is what good French cooking is all about. The texture was similar to tofu, and combined with a delicate dashi broth, each spoonful melted in your mouth. It’s best to get a reservation in advance, but there’s a great little hipster cocktail bar around the corner called Bespoke if you have to wait. An institution with locations in New York and London, this steak and frites chain never disappoints. And somehow, there’s nothing like the real thing in Paris. 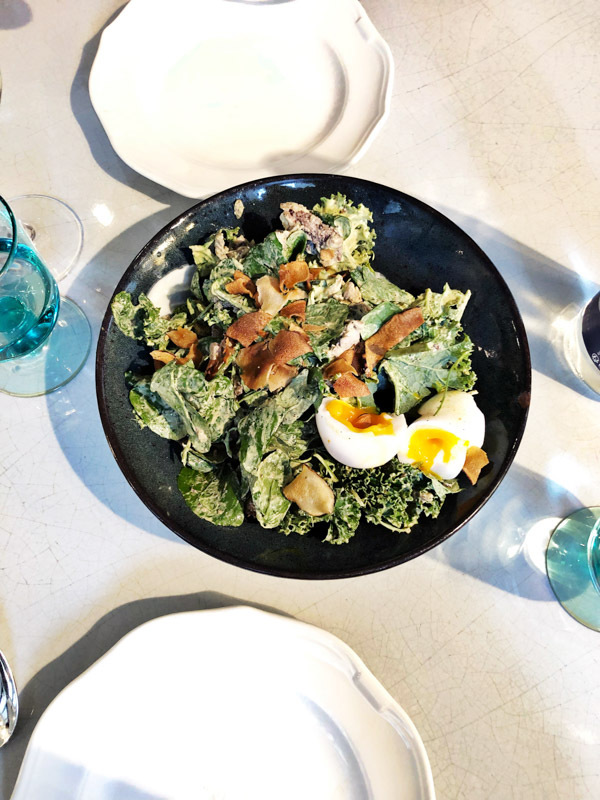 It’s also a perfect venue for celiacs, since the famous secret sauce is gluten-free and there’s nothing else on the menu but salad, steak and fries, so the fryer is also fair game. Save room for dessert, as their sundaes are legendary! I loved the neighborhood vibe of this place, which made me feel like we were back in Brooklyn. The food was simple, elegant and if I’m being honest, slightly underwhelming. We ended up here because of this Eater list, which said that the clams were one of the best dishes in Paris. Unfortunately, said clams had soy sauce in them (wah wah). Add it to your list if you want to check out a new neighborhood that’s more residential and bohemian. The one dish that really stood out and was worth returning for was the scallop with butterscotch. The menu changes daily, though, so perhaps we just ordered wrong. If you’re looking for a great spot to grab oysters or deviled eggs before or after dinner, this divey spot in the Marais is it. Compared to most cocktail bars in Paris, this one is a nice mix of tourists and locals. Another small cocktail bar with creative drinks, including one with kombucha and cucumber that I enjoyed. If you like 30 euro cocktails in a lavish setting, nothing gets more classic than this hideaway in the back of The Ritz. Go early and put your name down. Be prepared to take out a second mortgage to cover your martini. Slightly easier to get into than Hemingway, and equally expensive drinks in ornate surroundings. Charlie swears by a lunch time burger here as well. If you have an extra day, the Louvre is an obvious must. It’s so ginormous though that we chose to cross many of the smaller museums off our list and spend more time walking between neighborhoods. 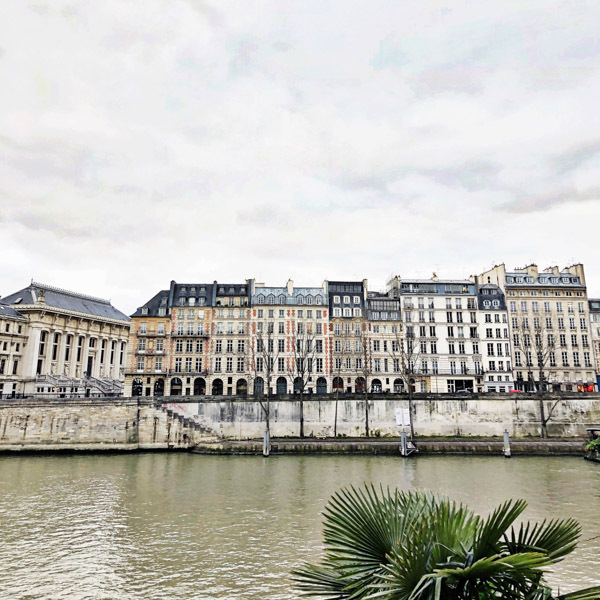 Another favorite that we didn’t fit into this itinerary is Sacre Coeur, which has an unparalleled view of the city at sunset and is a fun neighborhood to grab a pre-dinner glass of wine. Definitely go if you have one more night. 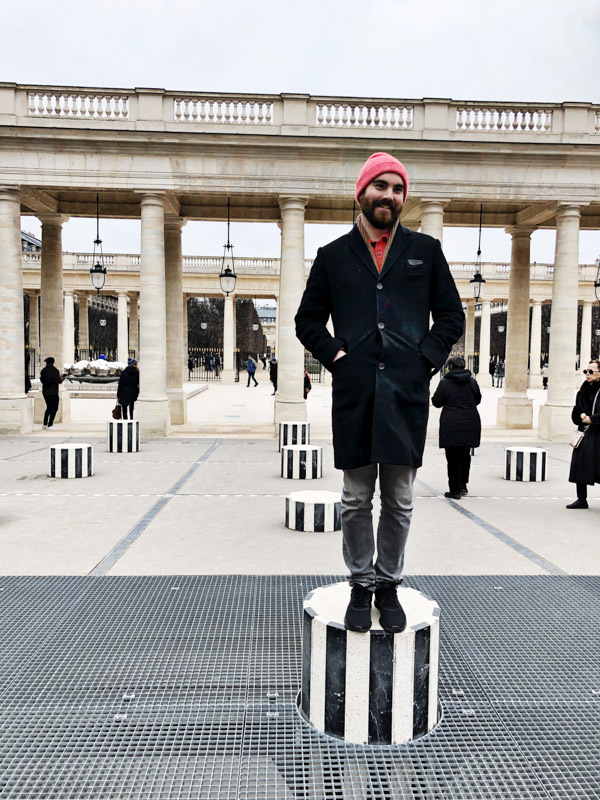 Also, it should be noted that we went to Paris in December. If it’s warm out, a meat and cheese picnic in the Tuileries or Jardin du Luxembourg is also a must. But the gardens around the Louis Vuitton Foundation are also beautiful for a picnic or romp. 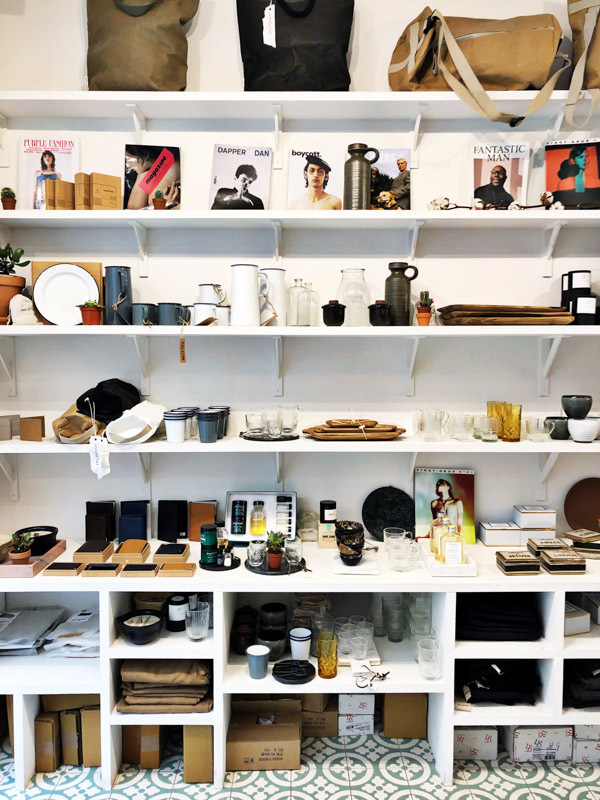 >>Spend the afternoon exploring the Marais neighborhood; stop into Merci for home goods and decor, and wander the shops and boutiques. 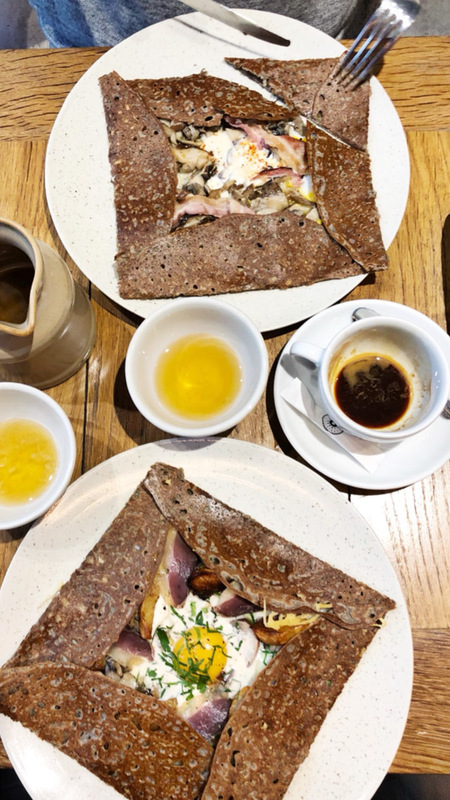 >>Have an early lunch of gluten-free buckwheat crepes at Breizh, along wtih a cup of one of their hard ciders (you’re in Europe, after all!). >>Head to dinner at Bistrot Paul Bert or Le Villaret for an authentic Parisian experience with all the typical fixings. You’ll be too buttered out by day 3 to handle this. 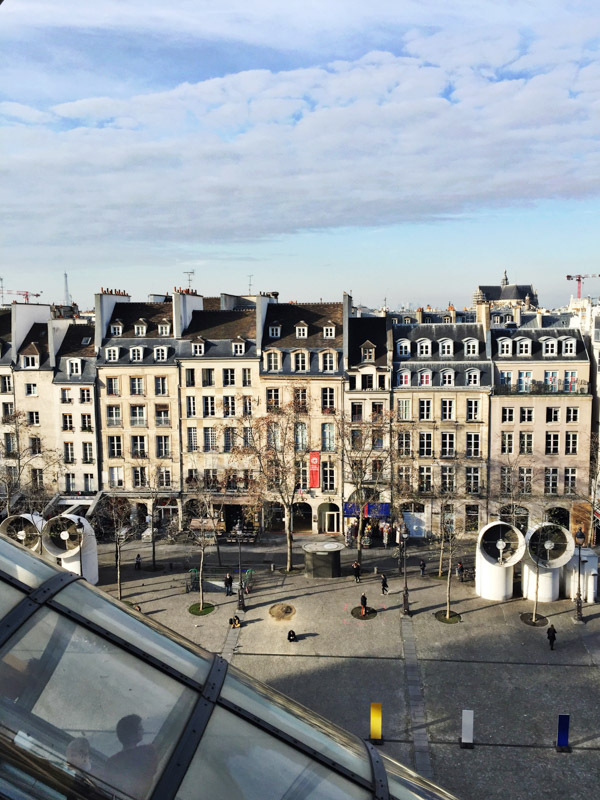 >>Start the day at Musee D’Orsay to take in the vast impressionist collection and early work of Manet and Van Gogh. 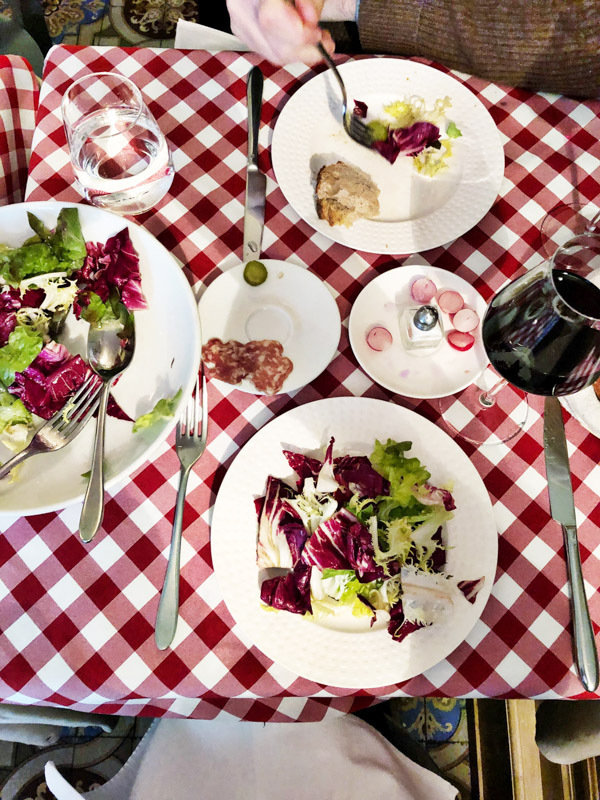 >>Stop for lunch at Au Petit Tonneau for a classic red gingham tablecloth meal of escargot, salad Paysenne and veal stew. 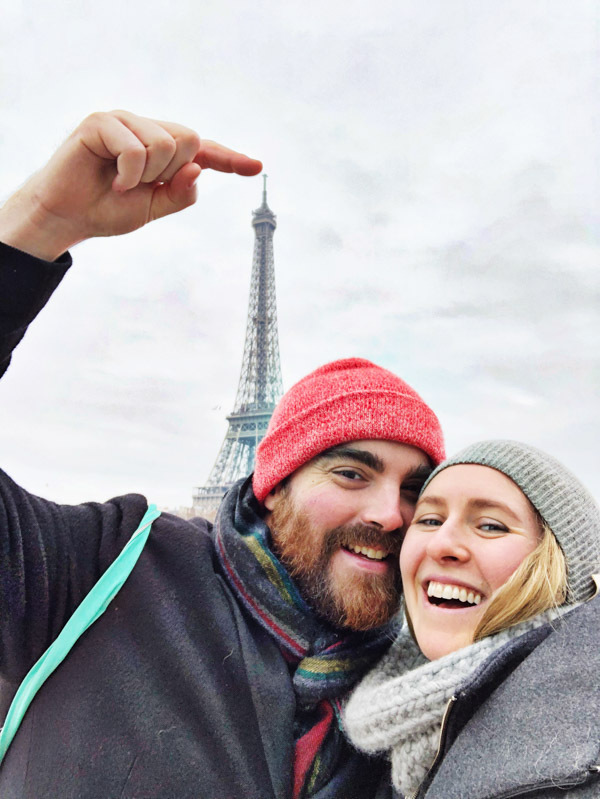 >>Continue walking off your meal to the Eiffel Tower for your requisite photo opp. 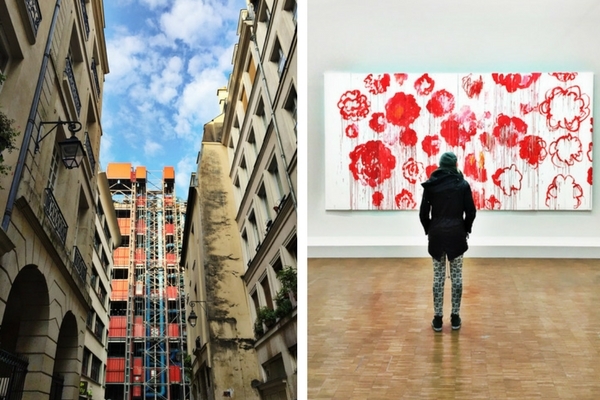 >> Either pop in for more contemporary art at Palais de Tokyo, or metro back to the St. Germain-des-Pres area and enjoy a cafe at a one of the old literary haunts – Les Deux Maggot or Cafe de Flore (touristy, but fun!). >> Take a break from all the butter with some nouveau French cuisine at Le Clown Bar or Le Grand Bain. Get past the ick factor and order the brains—it’s a must. >>Have a nightcap at the Hemingway bar at the Ritz. 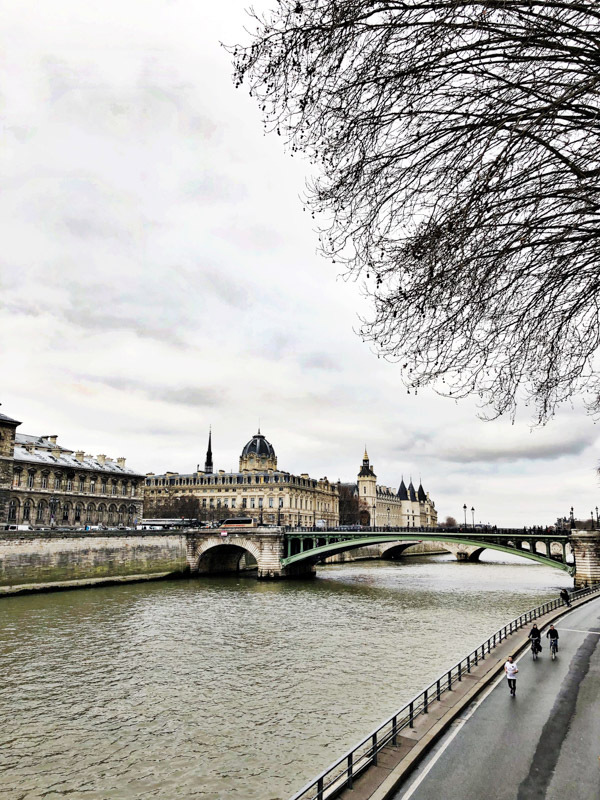 >>Start the day with a Franco-American brunch at Hotel L’Amour or Ellsworth (make a reservation in advance), or if you’re feeling overwhelmed by 48 hours of French food, a healthy bite at Holybelly, where you can also stroll by the water in Canal St. Martin. 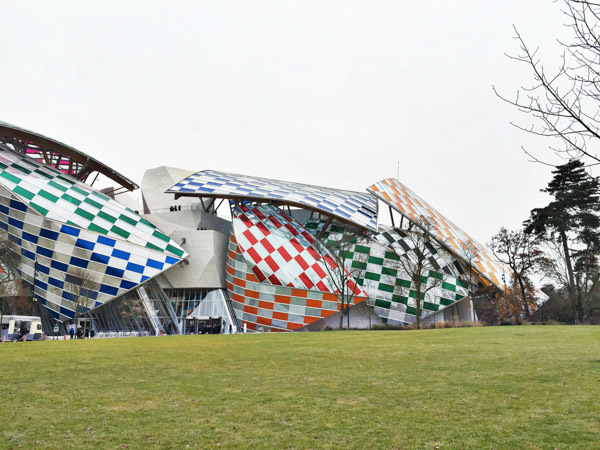 >>Venture further afield to check out the new Louis Vuitton foundation near jardin d’acclimatation, i.e. the coolest kid’s park that ever was. You can also swap this for a day at the Louvre. >>Enjoy a mid-day cafe and pastry at Helmut Newcakes, which has the best GF eclairs in Paris! >> Head home to wherever you came from, carrying all the shoes and baguettes you can fit in your carry-on. 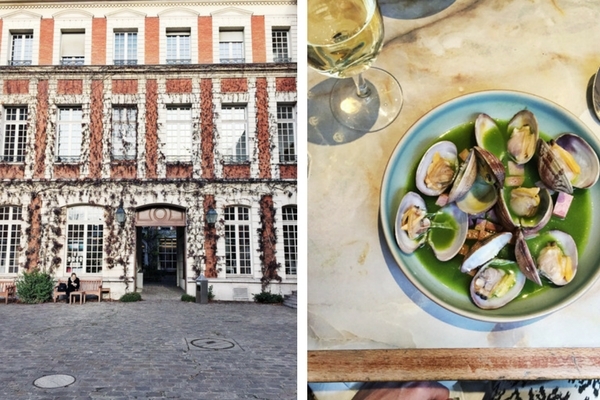 I got a lot of recommendations from readers on gluten-free and healthy restaurants in Paris. Especially in the Marais and the 9th, there are a ton of Brooklyn-esque smoothie and avocado toast spots cropping up. I didn’t find many of them to be worth it, including Wild & The Moon, which is now a chain. Their GF scone and acai bowl were sub-par, if I’m being honest. 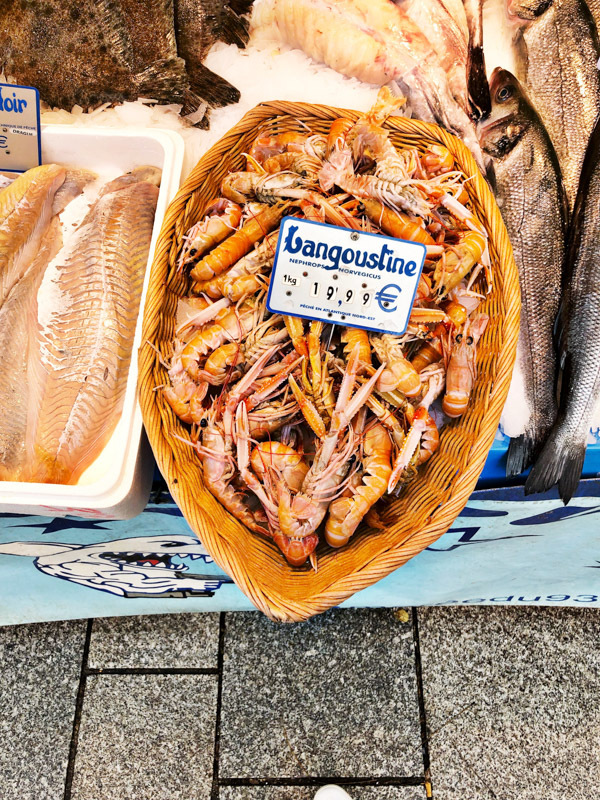 The produce in France is better across the board, and I’d personally, much rather enjoy veggies in the context of butter, cooked simply and traditionally, doing what Paris does best, than another culture’s attempt at avocado toast. That said, I’m including the full list below in case you want to try any of them, along with some more restaurants that I’ve been dying to try but haven’t been able to get to! These photos are STUNNING! I know I was just there too… but your pics are already tugging at my heartstrings to go back ASAP. We had a similar experience with Holybelly, haha. Got there starved, saw the line outside, and quickly rerouted to the nearest crepe cafe near the St. Martin. This is so valuable to me. Since being g-free and dairy free I have always considered Paris a dead loss for me, lookinh through the window and drooling but never able to eat the Parisian cuisine. I just went Lebanese or Moroccan or had salads. Now I know where to go for BREAD!! CROISSANTS!!! I’m going to cochon out next time. weeeeell. Still haven’t found the croissants, sadly. but the bread does help. as do the finnanciers. 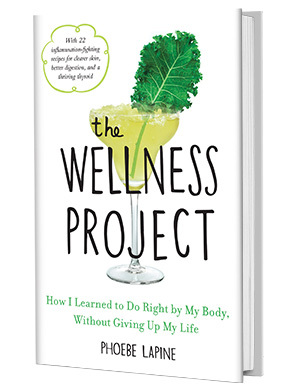 Thanks so much for your review and recommendations. 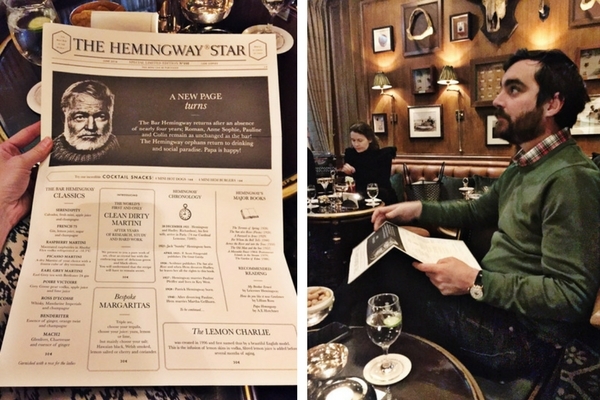 We went to Paris this weekend and used your guide as a starting point for our research – we had brunch at Hotel L’Amour! I appreciate the time and effort put into these travel guides, as it makes it much less overwhelming to start planning. While we aren’t gluten-free, I also just wanted to mention we had a very good meal at Le MaZenay. Really great value too! ahh that makes me so happy! Thanks for the other recs!